If you live in an area where termite infestations are common, you’ll need to know what to look for in terms of termite damage. While termite inspections are crucial, knowing what to look for between termite inspections can be a lifesaver. Checking for termites is actually simple – as long as you know what to look for. Below are a few things you’ll want to keep your eyes out for. An obvious indicator you have termites is the actual presence of the insects in your home. 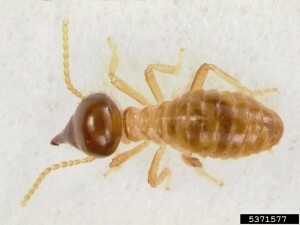 But termites live underground or inside wood, so it isn’t always easy to spot them. Because of that, you’ll want to keep your eyes out for flying termites. You’ll know they are termites because they have long translucent wings, and a long, thin, segmented body that is light brown or off-white in color. Dirt tubes are created by burrowing termites while they create supply lines between nest and food sources. The tubes look like narrow raised bumps or narrow channels made of dirt. Termites usually build these across solid surfaces like brick or cement. One way to be 100% sure it’s a termite tube is to cut one of the tunnels open with a razor blade or utility knife to check for the presence of termites inside. Damaged wood riddled with holes or cracks is a good indicator of a termite infestation. You might want to take a screwdriver and drive it into the wood, to see how it reacts. Wood containing hollow places along the grain that have been filled with mud or dirt could mean previous or current termites. Being on the lookout for termites doesn’t have to be a time-consuming process – you might even notice some of these signs without having to do any extra looking at all. Once you do see these things though, the first thing you should do is call a termite control professional. They’ll be able to fully assess if you have termites, and then help you determine the best way to get rid of them. Need help in Phoenix? Visit Termite Control Phoenix.